A couple of days ago I was sitting with the Lord and reflecting on what He has called me to do. I soon found myself in prayer for the wisdom I need to carry out the vision before me. Sometime ago I learned that it’s not my vision, its His vision that He has entrusted to me. And for the past several months as the Lord has been slowly bringing a lot of things into focus I have been totally focused on the path ahead. That is until that morning last week. As I poured out my heart in prayer I was taken back with a sudden thought that flashed across my mind. I’m so busy being about the business of the Kingdom that I’m missing the Kingdom! All at once I became aware of all that my concentrated focus had caused me to miss. That’s when I stopped and began thinking about what I thank Him for every morning. My first thoughts are always on the fact that He is the Creator and that everything around me is the result of His love for us. But I realized in that instant that I was failing Him and all I could think of was … Oh Lord, I’m Sorry! That thought has stuck with me and I have become a little more aware of God’s creation around me. It has slowed me down some and I am actually “seeing” things that I previously just “looked at.” It’s a lot like reading the Word. Are you just reading it or are you “hearing” it? There’s a big difference. Well, this morning something happened that put a smile on my face. As I was finishing my morning walk I saw a bird sitting next to my neighbors house just looking at me. I stopped and thought about what God had been sharing with me and I noticed that it’s leg was caught in some string and it couldn’t fly away. As I approached it began to flap its wings but as I picked it up it got very still and just looked at me. I tried to get the string untangled but couldn’t so I took it into the house and asked Amanda to help me. We got the string off and opened the back door and in a flap or two the bird was up in the tree. Not a big deal in the scheme of things and no huge revelation of the wonders of God’s creation. But the words that came up in my spirit were. You’re just like that little bird. You find yourself caught up in things and the more you struggle the tighter the grip they get on you. Take a lesson from the little bird I sent your way. Don’t struggle, just let Me pick you up and patiently wait while I untangle the snare that is holding you down. There isn’t a need in the world that goes unnoticed by Me and I will take care of them. Does a sparrow fall without my knowing it? 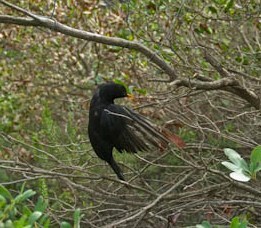 Does a tangled bird go unnoticed? No, I sent you didn’t I? But a few days ago you wouldn’t have noticed. Keep you eyes and your heart open for there are many that are caught and need to be untangled. But you won’t see them if you aren’t paying attention to all my creation around you. Well, if that wasn’t clear enough, I received an email from my dear sister in the Lord, Pastor Catia Baker that sort of put an exclamation point on the Lord’s message. I know this isn’t any earth shattering revelation but it underscored a lesson that I needed to learn. Perhaps it’s one that in your fast paced world you have forgotten as well. I suggest that you take just a few minutes and watch this video. Even if you’ve seen it before, just ask yourself how much of God’s creation you have enjoyed in the past few days. Then the next time you find yourself getting overworked or stressed, just take some time to look at the incredible creation that the Lord has placed here for you to enjoy… just because He loves you. Maybe, if you’re like me, it might be a good idea to take a moment and tell Him you’re sorry for taking it all for granted. If it weren’t for you it wouldn’t all be here. ← In Over Your Head? I am trying to identify the intaglio print of the healing of the woman who touched the hem of Christ. Do you have a date and artist for the piece on your website? Thanks!